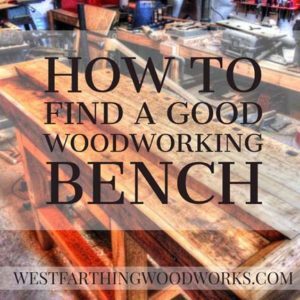 As you start to become a woodworker, and you find that you enjoy the craft, you are going to eventually need a bench. 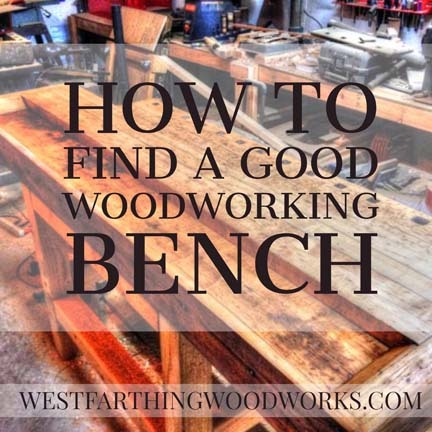 These are a few ways to find a good woodworking bench without spending a fortune. A nice bench will last a lifetime, and every ding and stain drip will be full of fond memories. Here is how to do it. The type of bench that you want can vary greatly depending on the type of work that you do in the shop. However, some things are constant throughout. 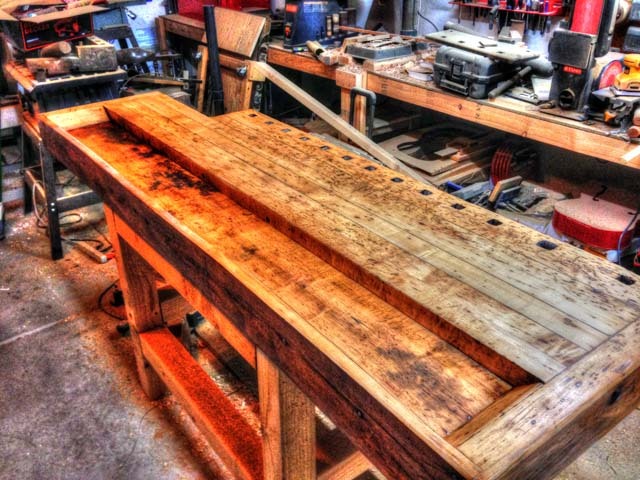 A sturdy bench that can take the force of hammer blows, carving pressure, and repetitive movements is important. You want a bench that is strong, and that can be a very stable place to build on. The woodworking bench needs to be large enough for the projects that you make. 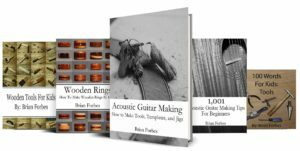 In the case of an instrument maker or a toy maker, this can be very small. However, in the case of a cabinet maker, it can be much larger. A great woodworking bench also has areas where you can clamp things, and areas where you can set down your tools. Look for a bench that has vises that you like. If it does not, you can always add them later. Lastly, find a bench that speaks to you. I know this may sound odd in the beginning, but certain benches just feel right. This may be due to the style, the age, or the history. In the case of my bench, it belonged to my grandfather and my father. That makes it worth far more to me than any high end woodworking bench. Spend a little time looking online or in second hand stores. Sometimes, people are getting rid of a nice bench and they have no idea what they really have. In a case like this, you can come away with a great deal. There are plenty of second hand markets online where people post things for sale. 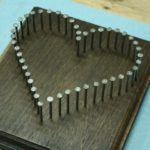 See if there are any carpenters benches or woodworking benches for sale. If you find a bench that you like, and the price seems right, go have a look. Be careful when visiting a stranger, and make arrangements so that you are safe. Inspect the bench, and see if it’s worth the time it will take to fix. Ask about the bench, and get the story. Sometimes you can find a real gem that someone just doesn’t have a use for. Lastly, call around to second had stores and ask if they have woodworking benches. Many times they wont, but you may get lucky and find one. If you do, check it out and decide if you like it. 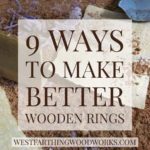 With almost any carpenters bench, especially one that you got for a deal, there will be some work that needs to be done. This is fine. 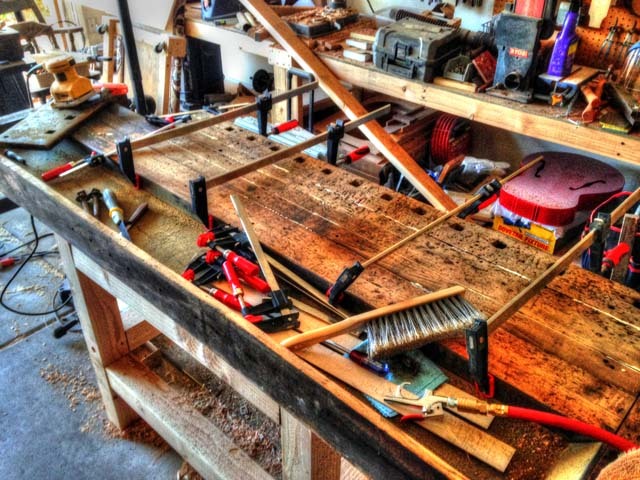 You are a woodworker, and you can fix a bench. 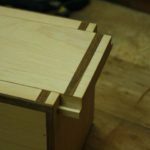 I wrote a whole article on how I fixed my bench if you want to see the entire process. First, remove any grease or oil from the surface and do a general clean up. Check the joints and the vises to make sure they work. Make a list of the repairs that need to be done, and start the process. 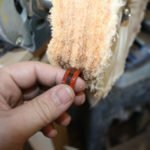 Glue together any boards that have separated, repair the vises if needed, and sand the top level. After sanding, coat the bench in a finish of your choice. This can be a simple Danish Oil, or something like Shellac. 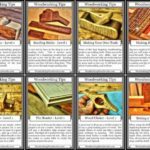 With any finish you choose, remember that you will quickly destroy the surface if you are working on it a lot. With that in mind, choose a thin finish that is easy to wipe on and repair when damaged. That is why I picked Danish Oil. 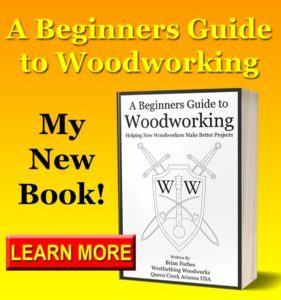 If you have any questions on How to Find a Good Woodworking Bench, please leave a comment and I will be glad to answer them. Also, please Subscribe so you don’t miss out on anything new. Happy building.